After graduation — if not earlier — we&apos;re all faced with the same question: what am I going to do for the rest of my life? The question rings true for artists, writers, designers, performers, and the majority of liberal arts majors. And it rang especially true for one of the most successful painters our age. Alexa Meade, now 27, was destined for an office on Capitol Hill when she finished Vassar. She grew up in Washington, D.C., majored in political science, and wrote press releases for the Obama Campaign during the summer before her senior year. But she soon became disillusioned by the campaign and had a small quarter-life crisis — she realized that politics wasn&apos;t her dream. "I had always dreamed of being an artist, but I hadn&apos;t made art in years," said Meade. Although Meade didn&apos;t take any art classes while at Vassar College, she became obsessed with the idea of shadows and painting on people. Humans became her canvas. 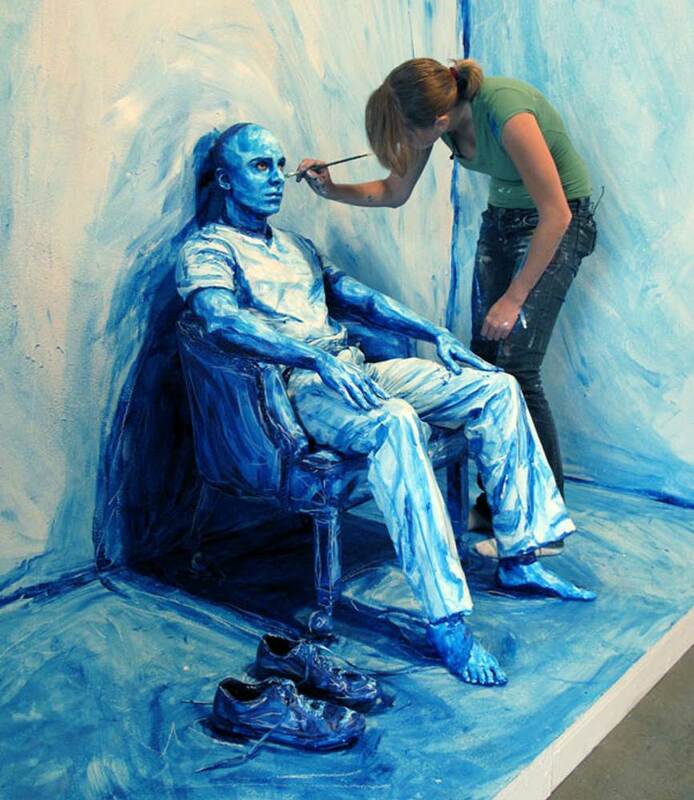 But Meade doesn&apos;t just stop with her subjects&apos; bodies; she paints the entire surrounding area — walls, chairs, clothes, you name it— to create an incredible illusion that her subjects are actually in living paintings. Sometimes, she sends them out into the real world to mingle with unpainted people. But she didn&apos;t get there immediately. After graduation, to appease her parents, she began applying for more conventional jobs. "When you tell people you want to be an artist, it kind of sounds like a euphemism for being unemployed," said Meade. But she decided to go for it anyway. After living at home for a year and turning her parents&apos; basement into an art studio, she caught her big break. A small blog posted a photo that linked to her work and within a day, it went completely viral. Meade made the front page of Reddit and, soon after, CNN and The Today Show picked up the story. "It was really only in that moment when I started getting external recognition from my friends and family for being an artist," said Meade. Now, Meade is receiving international attention for her innovative, contemporary style. Although she moved to Los Angeles more than a year ago, she admits that she hasn&apos;t spent much time in her new home. From painting murals on Mini Coopers in the middle of a busy intersection in Tokyo to hanging out and making art with her friend Gotye in Australia, Meade has been busy traveling the world. And although she still paints directly on people for live, one-day-installations, her art has expanded to include a pretty strange array of live environments — including bathtubs filled with milk. After teaming up with performance artist Sheila Vand, she created "MILK: what will you make of me?" "Sheila had this great bathtub and we wanted to figure out a way we could make a piece of artwork with it," explained Meade. The creative masterminds had the idea to submerge Vand in the milk tub after Meade painted her entire body. The result was magical. There&apos;s always a sense of playfulness in her work. That she values her creative play-time is obvious when you step inside her home. Her rainbow staircase leads to a living room brimming with feathers. And if the life-sized snow globe living room wasn&apos;t enough, she&apos;s transformed her closet into a black-lit jungle with spandex suspended from the ceiling. Meade went from business suits on Capitol Hill to a house full of feathers, and she — like many of us — still has no idea what the future will hold. "Hopefully my mind will be as equally blown in the future as it is looking back on the last five years," said Meade. Luckily for her, she has more skill than most when it comes to re-imagining herself.